Career Fair Hosting: How Big Should My Venue Be? So you’re planning a career fair? Take a deep breath! The thought of organizing an event like this can be overwhelming. There are many factors to consider, like the who, what, when - and most importantly - where. When figuring out where you should hold a career fair, be sure to account for the size of the venue. As vendors and attendees come in, you’ll want check in and register for the event. The registration area should be big enough for a line of students to form as they wait to register. Adequate space is important. Make sure there is enough room for people to walk around without bumping into each other. There should be enough space between vendor booths that recruiters and students can easily converse without being crowded. Scope out the parking situation for a venue before choosing it. If you know an estimated number of vendors and students that will be attending the career fair, make sure there will be ample parking. You don’t want people to turn away from your career fair because they cannot find a parking spot. Choosing a space for career fair hosting can depend on the budget. The bigger the space, the bigger the price tag. However, don’t forget to consider your profit margins. If you’re offering more space and a larger booth for vendors, you can charge more for the spot. This increased return allows you to budget for a larger venue..
As a rule of thumb, it’s better to have more space than needed. 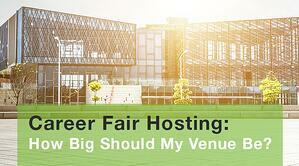 During your journey to find the perfect venue to host a career fair, keep spacing in mind. You don’t want students and vendors to be rubbing shoulders as they make their rounds. If this is the first career fair you’re hosting and planning - don’t stress! With the right venue and the proper preparation, it’s going to be a success. If you have more questions about hosting the perfect career fair, check out our blog for more helpful resources.